"An invaluable resource for any college and university striving tomeet the National Cost Commission's call to make what colleges doand what it costs more 'transparent' to the public." Defining and measuring faculty productivity are among the mostcentral issues for quality and accountability in higher education.Known for assembling some of the most authoritative research onfaculty productivity--and for analyzing its impact on academic andinstitutional accountability--Michael F. Middaugh presents thiscomprehensive volume to help campus professionals build greateraccountability for students, parents, foundations, governmentalorganizations, and other concerned constituents. Middaugh firstdraws from a research study funded by TIAA-CREF's CooperativeResearch Grant Program and the Fund for Postsecondary Educationwithin the U.S. Department of Education. 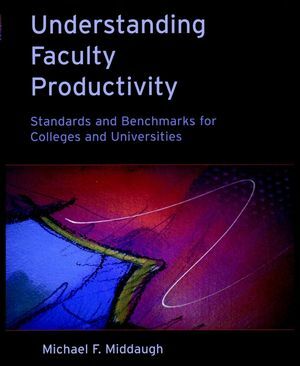 He then provides a newframework for analyzing faculty efficiency and emphasizes how theresults of faculty work can become the best indicators ofproductivity. He also applies the joint study findings to the taskof developing benchmarks for faculty productivity. Practitionersfrom any type of campus will find a rich array of data, valuablerecommendations, and relevant examples. MICHAEL F. MIDDAUGH lives in Wilmington, Delaware and serves as Assistant Vice President for Institutional Research & Planning at the University of Delaware in Newark, DE. He received his doctoral degree in Education at SUNY Albany. Dr. Middaugh has authored and co-authored two books on institutional research and written numerous articles and book chapters on topics in planning and research, including assessing faculty productivity.